Clear for Mac + Leap Motion: We’ve brought you a couple hands-on demos of the Leap Motion controller before, and today popular productivity app Clear for Mac announced it is working on bringing support for Leap Motion to Clear. There’s no timeframe yet, but Realmac Software provided the short preview above. Runtastic version 2.10.1: Personal fitness tracking app Runtastic gets a nice update today that brings more Sport types, improved Facebook integration, and number of other bug fixes and performance enhancements. The resurrected DataMan Pro has been completely reinvented to feature a stunning new interface, an intelligent real-time data usage forecast, and most advanced app tracking… The powerful App Watch technology that users love is also back. 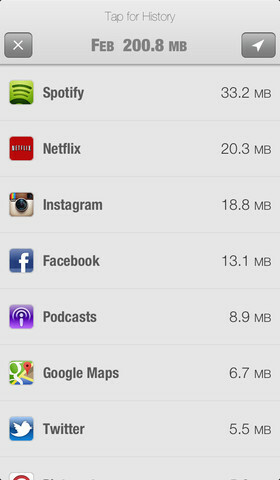 You can see the usage statistics for all apps. This amazing capability empowers you to root out data-hungry apps… The new DataMan Pro includes Smart Forecast and the beautiful interface that were recently introduced in DataMan Next. Combined with precise real-time tracking, you can say goodbye to overage. Our award-winning app (App Store Editors’ Choice & Hall of Fame inductee) is now also optimized for iPad and iPad mini! iPad users enjoy *all* the same app features as iPhone users, plus iPad-exclusives like a dual list/map view of hotels and the ability to compare details of multiple flights, rental cars, or hotels from a single screen. Hierarchical Master pages – Apply Master pages to other Master Pages, as well as control the positioning of master page elements such as headers, footers, logos, and navigation on individual pages. Spelling checker – Use the new Check Spelling command to confirm words are spelled correctly throughout your websites. Site preview enhancements – View portrait and landscape orientations of tablet and smartphone versions of your websites in Preview mode. Site export improvements – Easily manage updates to larger, more complex sites by publishing to a specific host sub-directory for sites hosted with the Adobe Business Catalyst service or with a third-party hosting provider. Code quality and performance updates – Ongoing code updates ensure your websites load quickly, are optimized for search engines like Google, and will work across multiple browsers. This update should fix a crash upon launch that affected a small number of users. (If you had to open Finish a few times to get it to stay open, this should fix that). It was totally our fault, and we rushed to fix it as soon as we narrowed down the problem. We’re really sorry about that. Thanks again, and please keep the feedback and suggestions coming! We’re hard at work on the next big update.